Today, human power is not appropriately recognized for its potential as an alternative solution to our growing energy needs. The bicycle is a great way of using human power in a way that allows us to exercise, transport ourselves and save on the consumption of conventional energy at same time. With no-pedal gravity powered bikes, you can achieve the transportation needs as well as save precious fossil fuels. An adrenaline-loving bike enthusiast is a force to be reckoned with as he reveals hopes of launching a new ‘gravity-fuelled’ event in the South West, reported by Exmouth Journal. A Gravity Bike? It is what it sounds like, a bicycle that goes downhill and otherwise has not much use. These machines are a joy to ride almost soothing; just the sound of the wind and road. Speed varies depending on the hill. A combined passion for bikes and recycling inspired Tony Nunn, a mechanic at Xodus Bike Works in Camperdown Terrace, to create his own, unique mode of transport - that has no engine, pedals or gears, but can reach speeds of up to 53mph. Tony’s gravity bike took him the best part of a year to build, using recycled parts from his workshop, and he is now keen to step things up a gear with plans to create a brand new event, incorporating street luging, skateboarding and riding. 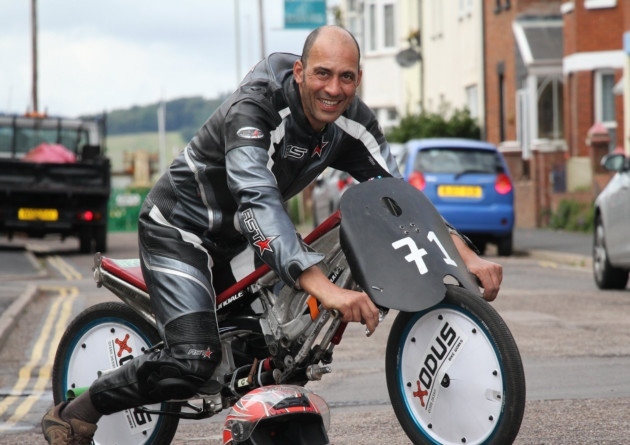 The 44-year-old father-of-two explained events specialising in gravity-powered bikes and soap box races were often held in the north of the country and he feels there is scope to bring the popular sports to more prominence in the South West. “It looks mad and suicidal, but I love it,” said Tony, of Sandhill Street, Ottery St Mary. “It’s just gravity pulling you down the hill - no engine or pedals or anything. “I have been in the bike industry for 30 years and I’m passionate about biking and this is all made out of recycled bicycle parts. “Initially, the craze [for gravity bikes] started in the early 1980s when BMX-ers got bored and came up with new things to do with their bikes. “I just took it to a new level and created my own style. “At the moment, my fastest speed is 53-miles-per-hour. “When I’m on the roads, I have a flag that comes off the back of the bike because it’s so low to the ground. “I’m also looking at the possibility of motorizing it just to give me more scope to use as a form of transport. It does turn heads when I am out on it.” Tony’s passion for recycling spare parts inspired not only the creation of the bike - which features unique single-fork suspension - but also other household items. Tony said his four-year-old son had been desperate for his own gravity bike since he set eyes on his dad’s beloved machine. The mechanic is working on building a side car that can be taken on and off the bike so his son can go out with him while he is still too young to ride himself. He is yet to set any dates for a specialist event close to home, but is working on developing the idea.